Ben Carson says a 22 week fetus can feel pain. Science says Carson is wrong. 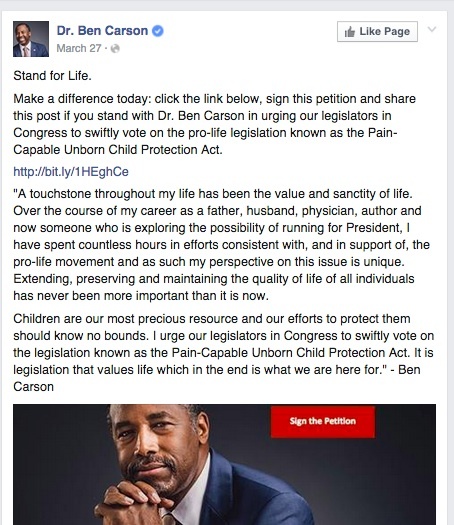 Dr. Ben Carson, neurosurgeon and GOP hopeful, recently asked his supporters on Facebook to sign a petition to urge congress to pass H.R. 36 The Pain-Capable Child Protection Act. This bill seeks to ban abortion after 22 weeks gestational age based on the lie that a fetus can feel pain at that gestation. The bill is commonly reported as a 20-week abortion ban, but it is really a 22-week ban because the authors couldn’t be bothered to use correct medical terms. OB/GYNs NEVER use “post-fertilization age.” It’s not a thing at all. It’s pretty offensive to write a bill about women’s health care and not even get the wording correct. “Pain capable” isn’t medical terminology either, it’s made up mumbo jumbo. Gives you an idea how much thought and research went into the bill. But Dr. Carson isn’t an OB/GYN so I’ll give him a pass on that abuse of terminology. What I won’t excuse him for is his apparent lack of understanding of fetal neuroanatomy. To feel pain a human needs an intact neural pathway from the noxious stimulus to the cortex, the area in the brain that interprets the signal. This is very important because a stimulus is nothing until the brain says it is pain. These pathways have been extensively studied and a fair bit of this knowledge comes from fetal tissue, yes, the same fetal tissue research that Ben Carson feels has “under-delivered.” Maybe if he read the research he’s know what I do. I’m both an OB/GYN and a pain medicine physician so I have a special interest in the area. Pain pathways travels through and area of the brian called the thalamus, a structure that as a pediatric neurosurgeon know very well. 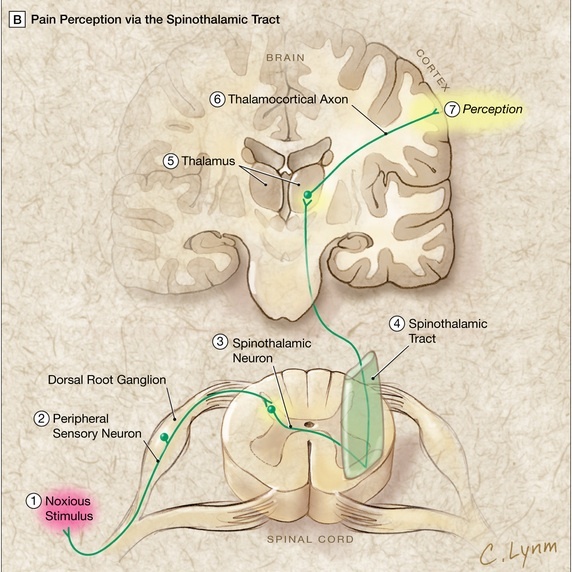 The thalamus is essential for pain perception, i.e. to be pain capable. The thalamus is like a fuse box for every single sensation that the brain will receive and interpret, with the exception of smell. If the thalamus doesn’t process the signal and send it on to the cortex as far as the brain is concerned it never happened. When do the thalamocortical fibers, the essential connection from the fuse box to the brain, develop? They start at 23 weeks gestational age – so one week AFTER the gestational age proposed in the bill that Carson supports. However, it is very important to note that 23 weeks is the earliest possible beginning of connecting up the thalamus to the cortex. The data looking at how pain is transmitted from thalamus to cortex and then processed in the cortex tells us that the mechanisms for pain perception are not in place until 28-29 weeks gestational age. Simply put a fetus at 22 weeks gestational age cannot perceive pain. That ACOG statement still applies and appears to be applicable to Carson. What makes Carson’s support of the Pain-Capable Child Protection Act so egregious is that the developing brain is his field. He knows the thalamus and the cortex or he should. Did he disregard well-established scientific literature while he was a practicing neurosurgeon or is it just now that he wants to compete in America’s next most anti-abortion politician? The science that Dr. Ben Carson studied to become a pediatric neurosurgeon tells us that a fetus cannot feel pain at 22 weeks gestational age yet he supports a bill that says otherwise. Dr. Carson isn’t some a Southern Baptist minister who never studied basic biology, he is a man who spent his career avoiding injuring the thalamus. If you don’t like abortion don’t have one. While I don’t agree with wanting to ban abortion because of a religion that I don’t share I have to say that is a morally higher ground than throwing your medical training out the window to pander for votes. Firstly, there may be reflexes which look as if a foetus, or a person, is withdrawing because of pain. This is not so, this is a reflex action. Secondly, and this is more complex, and relates to the gate theory of pain etc, and I’m not so sure how accurate and up-to-date I am. We were taught that there are no pain receptors, that pain is a response to a sort of ‘over-stimulation’ of other receptors, and all of this mediated through central pathways. The immediate response (or sensation) to a stimulus might be ‘this is very hot’ which would then be followed by ‘this is painful’. Germanic people had a very high pain threshold, but that those from Italy could not have their post-op controlled by any amount of morphine—to some extent, pain is a ‘learned’ thing. I’m a non MD (but aspiring Ob/Gyn) and I have a question on this topic…how does brain/pain development relate to really young preemies? I know the survival stats are pretty horrible for infants delivered at 23 weeks but they are certainly delivered-so are these babies (or even slightly older infants delivered up to 28 weeks) potentially not experiencing pain outside the womb?